Hello! 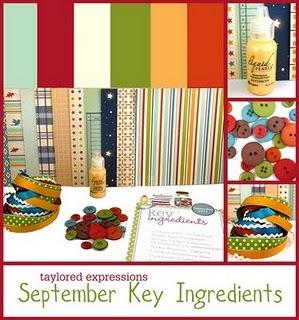 Have you seen the Taylored Expressions September Key Ingredients kit? I have this month off from posting on the KI blog, but my fellow design teammates have been posting some wonderful projects that are sure to inspire you. You can check it all out on the KI blog, HERE. I have been playing with this kit myself and have a birthday card to show you today. 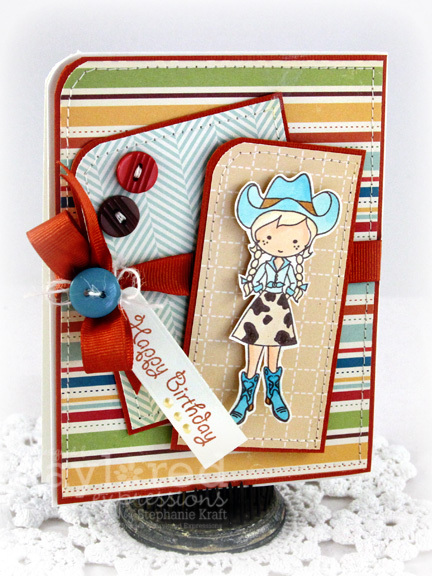 The patterned papers in the kit are from the October Afternoon Campfire collection. They felt a little "western" to me, so I decided to pair them with one of the sweet Moka girls, Moka Jane. I colored her with Copic markers and fussy cut her, then popped her on top of one of my layers. All supplies (patterned paper, cardstock, buttons, ribbon and Buttercup Liquid Pearls) are all included in this month's kit. I've only used a tiny bit of the kit on this card here, so I will be back with more to show you next week! (May Arts), Foam tape, Thread, Sewing machine. What a pretty card Stephanie, love the papers and the buttons... Big hugs and happy weekend! This is just darling! Can you believe I've never tried anything from Taylored Expressions? I really need to see what they have to offer.